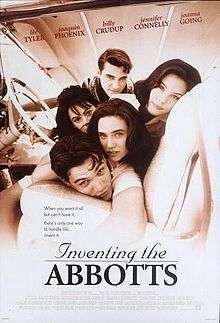 Inventing the Abbotts is a 1997 coming-of-age film directed by Pat O'Connor, starring Liv Tyler, Joaquin Phoenix, Billy Crudup, Jennifer Connelly, as well as Joanna Going. The screenplay by Ken Hixon is based on a short story by Sue Miller. The original music score was composed by Michael Kamen. The lives of two closely linked families dangerously intersect in a small Illinois town in the 1950s. Two brothers, Jacey and Doug Holt are growing up in Haley, Illinois, sons of a working single mother. Their father, a reckless risk-taker, has lost his life via a bet with Lloyd Abbott (Will Patton), his business partner. Abbott eventually becomes one of the town's foremost, wealthiest and most-admired citizens. The lives of the Holts and the Abbotts are intertwined through various entanglements. Lloyd Abbott and his distant wife, Joan, are the parents of three beautiful daughters, Alice, Eleanor and Pamela. Because of a misunderstanding of the circumstances surrounding his father's death (a supposed bet with Abbott that took the elder Holt's life), J.C. (Billy Crudup) seeks revenge on the Abbotts through the calculated seduction of the Abbott daughters. At first, J.C. cannot wait to escape the suffocating life in Haley, later in the film, however, he is pulled back as he idolizes the Abbott family, as well as obsesses about the oldest daughter, Alice (Joanna Going), thus seeking to jockey his way into the Abbott family. At first, Doug (Joaquin Phoenix), the younger brother, admires and worships his brother's libertine lifestyle. However, as he matures, he discovers that all that glitters is not gold. He eventually falls in love with the youngest, virginal Abbott, Pamela (Liv Tyler), who protests his early, fumbling sexual advances. She forces him to appreciate her for who she is, not what she may offer up to him. Meanwhile, Eleanor (Jennifer Connelly) is sent away to a mental hospital after she and J.C. are caught by Lloyd Abbott, who cannot keep them apart. After two years of being apart from each other, Doug and Pamela meet again by chance while they are in college in Philadelphia. However, Doug and J.C. are brought back to Haley after their mother's death. They also find a letter from their late father that says he has sold their patent for a 1937 DeSoto Coupe convertible. Despite the obstacles that Lloyd Abbott places in the way of any of the Holt brothers ever seeing his daughters again, Doug convinces Abbott at the end of the story of his true love for Pamela and receives his blessing on a future relationship. Inventing the Abbotts was poorly received by critics. The film holds a 31% rating on Rotten Tomatoes based on 26 reviews.